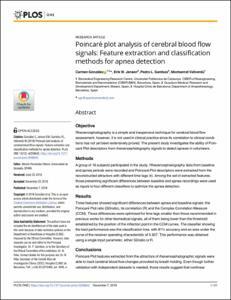 González Pijuán, C., Jensen, E.W., Gambus, P.L., Vallverdu, M. Poincaré plot analysis of cerebral blood flow signals : feature extraction and classification methods for apnea detection. "PloS one", 7 Desembre 2018, vol. 13, núm. 12, p. 1-21.